Mr Mark Coure MP. Parliamentary Secretary for Transport & Infrastructure and member for Oatley. This year, I was overwhelmed by the support that ACCF received. Special thanks to the ongoing support from our corporate sponsors – NAB Private, PwC and Invocare. It is with sincere gratitude for the support from our new Platinum sponsor, China Dynamics; Event sponsors – Mr Eric & Mrs Linda Wong of Golden Century Seafood Restaurant, Harry Georje Diamonds, Mr Alex Zhang of King Dynasty Restaurant, Chatswood, Ms Coco Zhou of Milton Park Country House Hotel & Spa, Marigold Restaurant and Gold Sponsors – ACETCA, B1 Group, WayIn Network Australia Inc, National Auto Glass Supplies, Clarity Accounting & Advisory, Dr Anthony & Mrs Winnie Yeung and Ms Maria Chan, prize sponsors and all the successful bidders at the charity auction – Mr Eric Wong, Ms Faith Tan, members of Way In Network Australia Inc, Mr Anthony and Mrs Rosalina Leung and Ms Anne Bi. The fundraising activity for Lifeline Australia had actually started in late January this year. 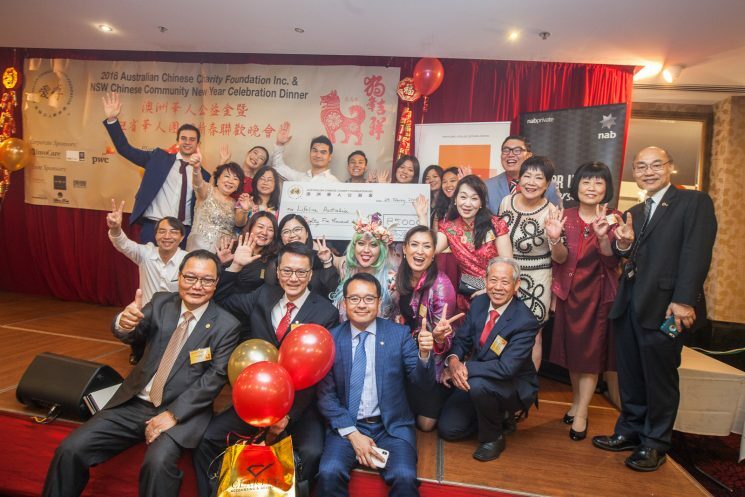 National Australia Bank had generously agreed to donate all the money raised in their Chinese New Year events in the states of NSW, VIC, Qld, SA and WA to ACCF. They had raised $27420 through raffle ticket sales. ACCF had agreed to match the funds raised dollar for dollar to a maximum of $6,000 in each of the states except NSW. ACCF’s pledge to the four states is $15,300. Together with the money raised for the NSW region at our New Year function, a cheque of $85,000 was presented to Lifeline Australia on the night. Lifeline Australia will in turn distribute the funds Australia wide as per the amount raised in each state. A group of young people ages 9 to 15 from the Sydney Musicool Orchestra presented the evening’s entertainment. Thanks to the co-ordination of their Director, Ms Sally Xiao, the performances were a huge success. I would like to congratulate and thank our new Masters of Ceremony to ACCF, Miss Emily Mo and Mr Damian Meduri. Their hard work and professionalism enabled the programme ran according to schedule. I would like to acknowledge the entire organising team and venue volunteers for their perfect logistic support, set up, floor management and for all the effort they have put into making the event a huge success. Last but not the least, my heartfelt thanks for the support from our media friends, Patrons, Trustees, members and community representatives. Thank you from the bottom of my heart and may God bless you all.